Michael Kors rose to international prominence after the brand’s chief creative officer and founder, Michael David Kors, joined Project Runway as a judge at the height of the reality show’s popularity. Kors, who was born in 1959, was already established as a sportswear designer when he broke onto the show’s set, but leveraged the opportunity to convert his brand to a household name by shifting to a new focus: Handbags. Left: Taylor Swift heads out with the “Casey” satchel. Right: Hilary Swank attends an event with a Spring 2013 buckled clutch. Today, Michael Kors-branded leather goods are coveted by men and women all across the globe. The brand namesake’s creations are so popular that counterfeits have started popping up. While some customers buy fake purses and wallets willingly, many others simply can’t tell the difference when shopping online. We’ll show you eight easy ways to tell whether a Michael Kors bag is the real deal. Michael Kors bags have become synonymous with Saffiano leather. If you’re unfamiliar with thei brand’s trademark material, Saffiano is calf leather with a fine criss-cross pattern machine stamped into it. An original will feel structured and rigid, while synthetics tend to be soft and floppy. Original Saffiano leather will also have a slight gloss to it. Michael Kors typically uses two different logos: the expanded one and the circle emblem. The expanded version should be precisely cut with sharp edges, and the letters should be evenly spaced. Inauthentic versions of this logo tend to stand out from the leather more, while legitimate logs are embedded into the leather, and perfectly centered. The circle emblem shows the letters M and K at the center. The letters should be distinct and surrounded by a perfect circle. Often, fakes will feature logos that look a little wonky and unsymmetrical. Logo hardware should feel heavy and substantial, and not like coated plastic. From time to time, Michael Kors does use a plain MK to embellish some bags as well. 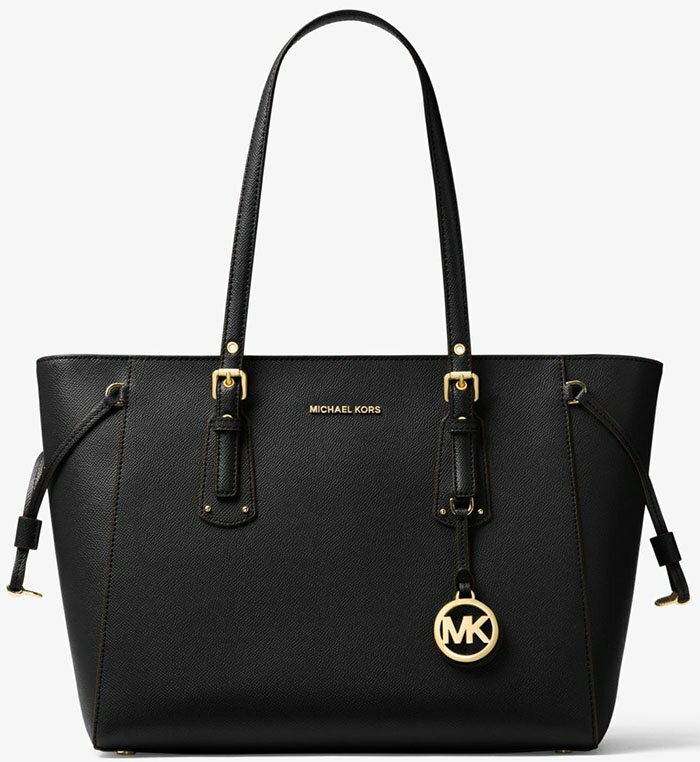 An original Michael Kors bag should use sturdy hardware to fasten the handles to the bag. Fake bags typically use general rounded handles that don’t feature stamping. On authentic bags, the joint hardware is slightly rectangular with rounded edges, and the expanded logo is stamped on one side. The original hardware should also feel hefty. Another subtle telltale sign in an original Michael Kors is four even and perfectly proportionate stitches underneath the handle hardware. Counterfeit Michael Kors bags do feature the four stitches as well, but they’re often sloppily executed. Below the stitching is a screw. The screw on an original should feel flat to the touch and shouldn’t protrude from the bag. The handle of an authentic tote must be made from premium leather and shouldn’t wrinkle around the foam tube. Additionally, leather tabs should neatly conceal the handle edges instead of exposing the edge stitching. Authentic Michael Kors zippers have a brass finish, and are usually paired with an elongated zipper pull. The expanded Michael Kors logo is engraved cleanly onto the pull. Counterfeit zipper pulls will typically use the rounded logo, and are usually made out of plastic with a metallic finish. This type of pull is noticeably more prone to breaking, flaking and chipping. When opening or closing the zip, an original should feel more rigid. 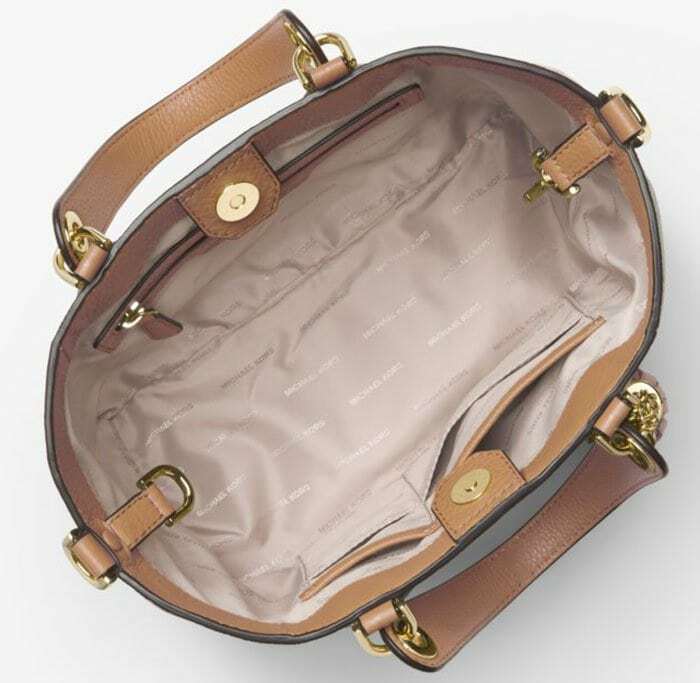 Pay close attention to the structure of the bag upon opening the zip: the shape of an original will remain structured, while a fake will gape wide open. Another tip? 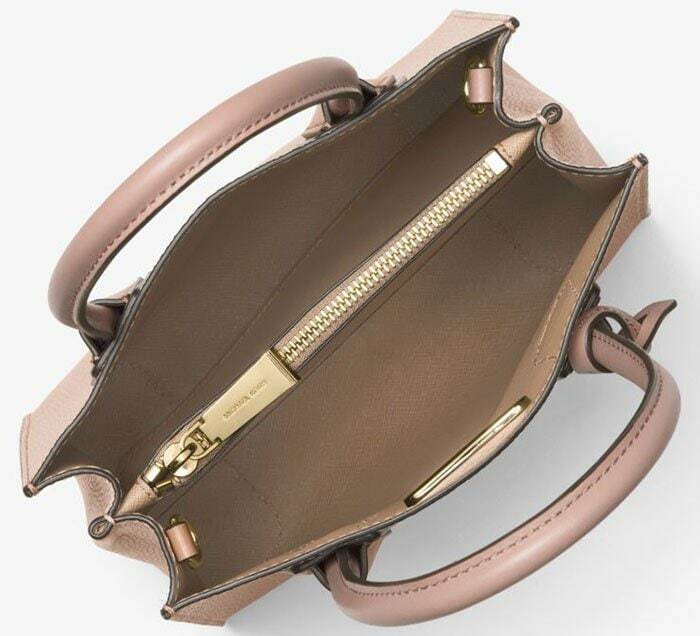 The zipper on an authentic Michael Kors bag ends before the leather tab, whereas the zipper on a fake usually tucks into it. A nicely sewn loop should hold the strap to the tote body. On classic MK bags, the loop is stitched above the seam. On fakes, the loops tend to be stitched into the seam. The small difference in stitching makes the strap less durable and more prone to snapping. In an authentic Michael Kors bag, exemptions are made when the straps are sewn into the seam for aesthetic purposes. In other models, the straps are usually sewn on cleanly on the outside of the tote body. Check for precise stitches and neat leather tabs that conceal the handle ends. Bags made more recently use clasps, grommets and buckles instead. Most of the shoulder straps in the newer models are removable. 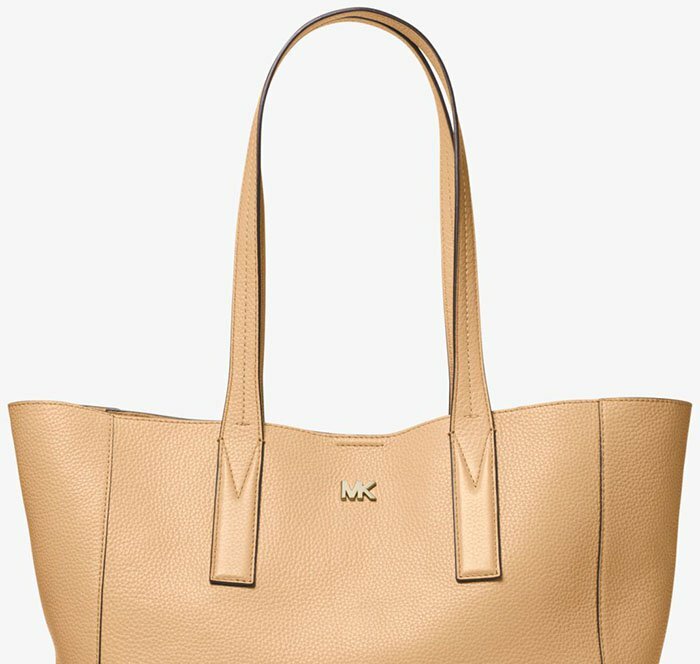 A lot of fake MK totes are lined with logo print material, but they still feature telltale signs that they’re faked. 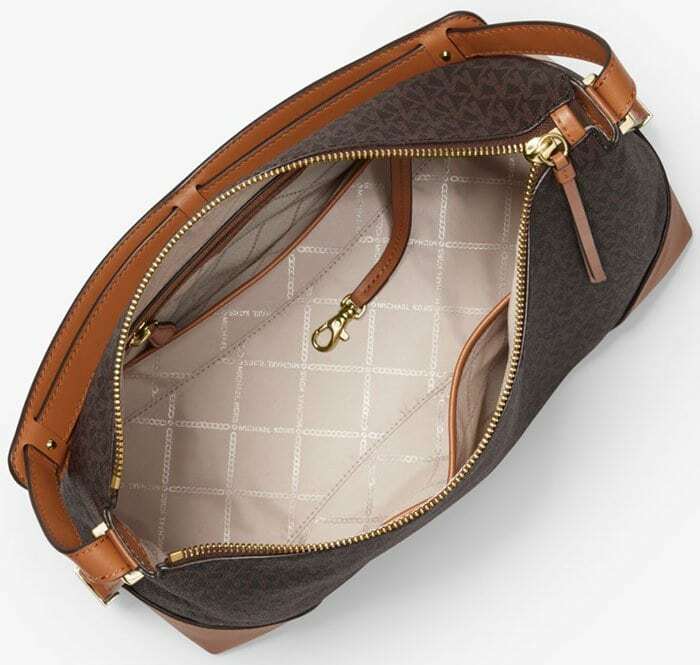 Original Michael Kors totes will uses a light, almost beige shade in lining materials. Most replicas will use a darker material. Knock-off logo prints tend to be heavily shaded, and the logo acronym faces in different directions instead of the single direction that original logos face. Both linings are synthetic, but the fake one will likely rustle more, and feel stiffer than an authentic. Left: Freida Pinto carries a light reptile-print leather tote. Right: Karlie Kloss matches her jacket to a Michael Kors tote. Michael Kors has recently been using the expanded logo on all its newer bags. This can either come in a standard horizontal pattern or cross-hatched with a chain pattern. Michael Kors has also started to produce suede and Saffiano leather linings that don’t have a pattern printed on them. On larger totes like the Hamilton, one side of the lining will have a zipper pocket with a piece of leather framing the zip. A counterfeit will have a less-than-graceful leather piece that is more rounded than the original. Usually — but not always — both sides will feature open pockets. The more classic bags will have one with a cellphone pocket on the left and a flat pocket on the right. The opposite side should have two flat pockets. Fakes tend to duplicate the cellphone pocket on both sides. While the pockets may vary from one bag model to another, all open pockets should be should beautifully lined with leather at the edges. The only exception? Handbag models that are lined with suede. Michael Kors bags often usually feature a lobster clasp made for attaching keys to. This detail is often overlooked in counterfeit totes. Like all designers, Michael Kors changes details constantly, so it’s good to keep yourself updated on new products and releases every season. The Michael Kors website offers a great zoom function that allows prospective buyers to get a close-up look at every product’s finer details. 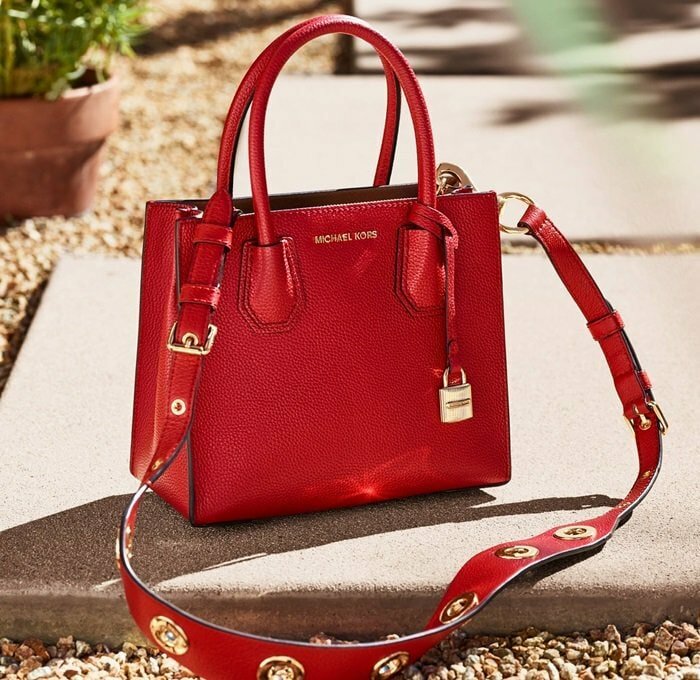 If you are still unsure as to what an authentic Michael Kors handbag should look and feel like, visit an official retailer near you and get acquainted with the real thing. Where are Michael Kors products made? It’s a well-known fact that most of Michael Kors products are sourced from China. If you see a “Made In” tag that lists a country other than China, however, don’t panic. Michael Kors also produces authentic goods in Italy, Turkey, Indonesia, the Philippines, Vietnam and Korea. How much do Michael Kors bags and wallets cost? Michael Kors bags fall within the range of $50 to $18,000, while wallets can range anywhere from $30 to $895. The official Michael Kors website constantly updates the brand’s list of prices, and lists the occasional sales price as well. This video is also a great resource to differentiate between authentic Michael Kors bags and fakes.